A studio publicity of shot Kate and Cary for George Cukor's HOLIDAY (1938), their third film together and an unconventional love story about two social misfits who find each other in a sea of high society stiffs. 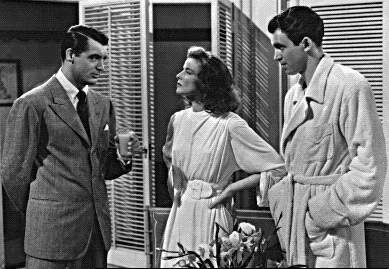 Together for a fourth and final film, this time joined by Jimmy Stewart in THE PHILADELPHIA STORY, the Oscar-winning Best Picture of 1940. "Nothing like having a wife that can support you." --as Alec Walker in IN NAME ONLY (1939). "When the cat's away, the mouse will play." --as Alec Walker in IN NAME ONLY (1939). "If you're going to kill someone, do it simply." --as Johnnie Aysgarth in SUSPICION (1941). "You were lovely of form and face, but I had a feeling that if a gnat dove into your pool of knowledge, he'd break his neck." --as Pat O'Toole in ONCE UPON A HONEYMOON (1942). "Insanity runs in my family . . . it practically gallops!" --as Mortimer Brewster in ARSENIC AND OLD LACE (1944) (a .WAV file). "Holy Mackerel!" --as Mortimer Brewster in ARSENIC AND OLD LACE (1944) (a .WAV file). 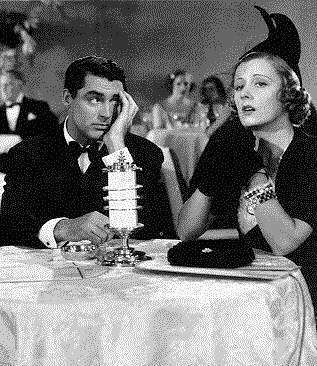 Apart from Katharine Hepburn, Cary made several of his best early films opposite RKO's other queen of the lot, Irene Dunne. In THE AWFUL TRUTH (1937) (at right) they play an obstinate young couple bent on divorce and fighting over custody of their dog, Mr. Smith (again played by Asta), all this despite the fact that they still love each other. Later, in MY FAVORITE WIFE (1940), Dunne returns from an extended stay on a deserted island to find her husband Cary haplessly remarried to Gail Patrick. 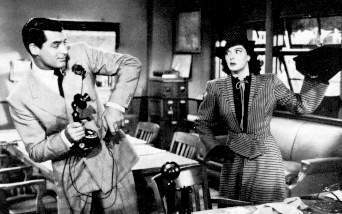 After the resounding success of these two screwball comedies, they proved their combined dramatic mettle in PENNY SERENADE (1941), playing a young married couple struggling through hardship and heartbreak. 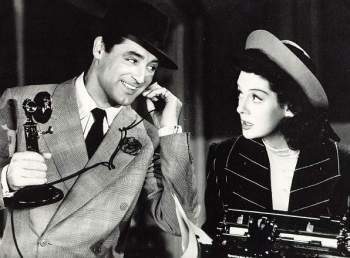 In 1940, Cary reteamed with BRINGING UP BABY director Howard Hawks for one of his all-time best films, HIS GIRL FRIDAY (1940), a gender-bending adaptation of Ben Hecht and Charles McArthur's hit play "The Front Page" co-starring Rosalind Russell as the ex-wife and star reporter of Cary's newspaper The Morning Post. 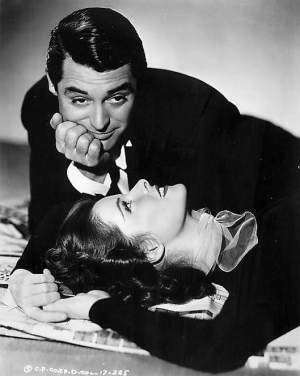 Cary's three hugely successful comedies of 1940 established him as Hollywood's quintessential screwball comedian, and though his attempts to play varied roles in subsequent years met with mixed reactions, no sub-par box-office returns could take away the fact that Cary Grant had become a bona fide star.